Rather than being a film that is meant to pull on the human need to protect, Wardance makes the children of Uganda seem more literal. Dominic, Rose, and Nancy seem more like a person you would know. They have things that they are passionate about and don’t let the negative things of their past inhibit their futures and potential. It is important for them to share their story, more than the stories of their past it is important to acknowledge the reality of their futures. They are not just another sob story, they are human beings who can move on. I believe Wardance stands out because of this. Hope is visible throughout, and more than a movie for the children of war zones, I believe it is a movie for us. They have hope and passion, why don’t we? In War Dance directed by Sean Fine, we’ve seen the many children of the Acholi tribe struggle in the corrupted society of Northern Uganda. Despite the horrors and trauma they experienced, they relieve their stress through the art of music. The children such as Nancy, Domonic, and Rose revealed their tragic past due to the Lords Resistance army that struck their lives and stole their innocent childhood. Although we did not witness the actual scenes of the Lords Resistance army, we gained a lot of shocking statistics that were impacting the population. Even though the orphans suffer from these horrifying events, their source of happiness comes from the music competition. It was the only hope they survived for. It was very emotional to see these traumatized adolescent teenagers find their light by dancing with their heart and singing with their pure souls. “War Dance” was a very inspirational movie. Even though the children were put through horrific tragedies, they are able to express themselves through music and dance. The things we will remember most are: the image of a dark sky and a crack of lightening used to symbolize the time of tragedy; the image of Rose’s mother’s skull being pulled out of the jar after her murder; and also the sheer joy that the children express after winning the war dance category in the music and dance competition. “War Dance” impacted our views upon the crisis children in Uganda are facing. This movie showed viewers the struggle that the children in Northern Africa had to go through during the war between the LRA and the Uganda government. It created a lot of sympathy towards the natives of Uganda. Also, it exposed the measures that they take in order to maintain happiness and hope. Through dance, they were able to distract themselves from the issues occurring at home. The children of Uganda were able to maintain determination and enthusiasm even during the struggles they faced when treated as inferiors by the southern Africans. They displayed their creativity and optimism through the varieties of musical performances they conducted during the competition. Many had experienced tragic events in their past, and they used these strong emotions to further develop the music and dances they performed. A great amount of passion was found in these children and their aspirations to overcome all they had faced allowed them to successfully compete. Ironically, the children who were considered the “rebels” of the nation gained the strength to overcome the brutal judgment imposed on them. After the movie finished, Guadalupe Mora, Williamscott Sorge, and Jennifer Garcia had a discussion. The image that struck Guadalupe Mora greatly was when Dominic began to cry. Dominic was a witness during her own mother’s death. “This was a very emotional realization about the horrors young children had to go through,” said Guadalupe. “I was very touched when hearing about the struggles they faced and the death that they have experienced in their lives. I can not begin to imagine how the emotions running through them and how I would cope with it all if I were faced with all the same hardships that they were,” said Williamscott. “My eyes suddenly opened up to the brutal struggles children younger than my generations were emotionally going through every day,” said Jennifer. I think it is horrible how children in Uganda are being kidnapped and forced to fight for the rebels in the Lord’s Resistance Army. It is terrible how these children were traumatized and forced to kill other people. I couldn’t believe how the boy Dominic in the documentary admitted to brutally beating down three innocent farmers to death with their own farming hoes with other kidnapped children. I thought it was horrible the Ugandan girl Rose’s parents were brutally killed by rebels with machetes. It was gruesome and morbid how Rose watched a rebel pull her parent’s decapitated heads out of a pot. I think it is amazing how despite everything that the children are going through music, singing, and dancing lifts up their spirits and drowns out their sorrows. One lasting image War Dance that will stay in my head is when all of the kids were traveling to the music competition in Kampala in an armored bus with armed guards protecting them. That image was very powerful to me. That image shows how dangerous the war in Uganda is that armed soldiers have to protect the children just so they could go to an innocent music competition. This movie showed me just how bad the situation over in Uganda is and how evil people really are. It showed me how horrible a civil war can be when people are killing their own people. By watching the movie War Dance, I was able to see how the children of Uganda were deeply traumatized due to many tragedies. I saw how each person like Dominic, Rose, Nancy, and many others who had gone through the deaths of their family members. Due to these tragedies they are traumatized and there only way to escape this trauma is by dancing. They are not only competing to win prizes and to be the best, but also to help them forget about their bad memories and not have to remember it all the time. Dancing and socializing with other people helped them to escape or forget about their bad memories. It is sad to see this, because today in America children don’t suffer like this when they are young. Or if a child is remembering a bad memory they don’t have to dance, today we have many technologies and therapies we can take for a child to overcome a tragedy that they’ve been through. I found this movie very informative and emotional because it provided a good sense of how the teenagers and the rest of the people were living under these conditions. Looking at how here in America we have everything we need. It’s sad to see how others around us don’t have what they need and if they do they have to struggle to get what they want or even to have a piece of bread in their mouths to survive. Overall, I consider us very fortunate to have what we need to survive, but we should still do our best to care for the others who aren’t as fortunate as we are in America. 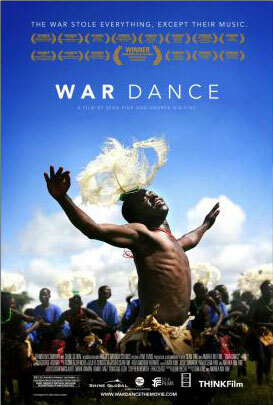 War Dance was a very powerful movie in terms of visuals and the messages which it denoted. The images of lightening and tears allowed me to gain more empathy for the 3 children Dominic, Nancy, and Rose. Each and every one of their stories were devastating as all of the children had to face different sorts of quagmires which all included the loss of a person(s). My respect for the children formed knowing that they were and are staying strong despite their hardships and even putting in the courage to speak about their tragedies. It’s not easy; it’s not easy to redeem one’s self even after losing loved ones who have supported support him/her. Dominic’s story was quite shocking—to know that a child forcedly and reluctantly had to kill other innocent people really proved the evil which still lives in the human. I feel that all of this ties in to show a message for all of us; we should genuinely be grateful for what we have and learn to respect others for their differences and not condemn innocent people to be in situations which they don’t deserve to be in. Overall, War Dance was truly an impacting movie which left a lasting impression on me. War Dance was a film that deeply touched my heart and moved me from hearing the personal accounts of Nancy, Rose, and Dominic to witnessing how they were transmogrified from wounded children with egregious pasts to musicians worthy of winning Uganda’s music and dance competition. These children worked assidiously and made their past not get in the way of their future. They were all faced with deplorable dilmnas like Dominic having to kill farmers and Rose having to retrieve her parents skulls from pots. However, these problems did not hold the children back but made them stronger as people and proves that they can surmount any obstacle because of their dark pasts. War Dance is a movie which had a big impact on me. It tells the story of three children in Uganda, who lost their homes and families. The three, along with other children in Uganda prepare for a music and dance competition. All the kids work really hard because they want to win really badly. I thought that it was amazing that these children kept on going and didn’t give up hope even after what has happened in their past. Many people wouldn’t be able to live with the image of their parents getting killed, but these kids stayed strong, which is really amazing and brave of them. This movie touched my heart and it showed me how people keep hope even after having gone through so much in their live. This is a bittersweet movie that was an emotional roller coaster, but I am very glad I had the privilege to watch it.